Madison is the newest face in the Speech Therapy Department at Magee, and we feel so lucky to have her! Aside from being super knowledgeable, she’s a team player with a positive attitude and great personality. Make sure you say hi to her if you haven’t met her yet! Today, we learn a little bit about Madison. Ashley Owens (AO): Why did you decide to become a SLP? Madison Liss (ML): It’s hard to say the exact moment that I decided I wanted to be a speech-language pathologist. Growing up, I always knew that I wanted to be in a “helping profession” where I’d have the opportunity to positively impact others. In college I decided to major in Psychology, Education, and French, but through my internship experiences, I struggled to find opportunities that really combined my love for language, communication, and helping others. It wasn’t until my sister encouraged me to do some career shadowing that I found my love for speech pathology. After shadowing several speech therapists in a variety of settings, I knew that this was the job for me, and I couldn’t be happier with the path that I’ve chosen! AO: What is the most exciting part about your job? ML: There are so many exciting and fulfilling parts of being a speech pathologist. For me, the best part is having the ability to connect with my patients and build relationships beyond our therapy sessions. It is so inspiring to meet people from different places and backgrounds with their own unique stories and triumphs. I feel so lucky to have the opportunity to learn from my patients and their families and to assist in the recovery process in any way that I can. Having the ability to truly and profoundly impact another individual’s life is undoubtedly my favorite part of this profession. AO: Do you have a particular experience or patient that made an impact on your life? ML: There is one patient whose motivation to succeed has always stuck out to me and continues to inspire me every day. I started working with this young man at my previous job as an SLP in a nursing facility. He had a severe stroke paired with a complex medical history, and as a result, he was unable to eat or drink anything safely. Given the extent of his impairments, his doctor told him that he likely would never eat again. Through months of hard work rehabilitating his swallow and perfecting strategies to eat/drink safely, we were able to get him back to eating a full diet. His course of recovery was very trying, both physically and emotionally, but he persevered in order to meet his goal of being able to eat again. I’ve been fortunate enough to meet so many inspiring individuals in my time as a speech therapist. I am extremely grateful that each patient I’ve worked with has taught me something new and unique about myself and this profession. AO: How would you describe your job to someone that doesn’t know anything about speech therapy? ML: It always makes me smile when I introduce myself as a speech therapist and I receive the response, “I don’t need speech therapy – my speech is fine!” I think it is so common for people to have a specific conception of the field, whether it’s helping toddlers say their first words or helping an elementary student say the “r” sound. The amazing thing about speech therapy is that there are a variety of settings in which SLPs work, including schools, hospitals, and private practices. 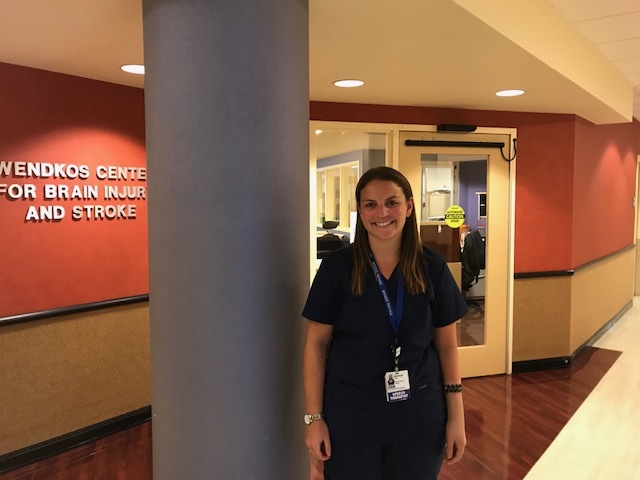 As a speech therapist in a rehabilitation setting, I evaluate people with a variety of diagnoses, such as strokes and traumatic brain injuries (TBI), with the goal of helping people with their eating/swallowing, speech, thinking skills, and ability to understand others and express themselves. We are always collaborating with the medical team, occupational and physical therapists, case managers, and even family to ensure that each patient maximizes their recovery during their stay and is adequately preparing for discharge. AO: What do you enjoy to do in your free time? ML: After work and on the weekends, I love spending time with friends and family. If possible, I prefer to spend my days outside – whether that’s going for a long walk on the Schuylkill trail, playing soccer, reading, or spending my days at the beach! To learn more about the Care Team at Magee, click here.